Sheffield City Region's (SCR's) excellence in advanced manufacturing and engineering was showcased to the world today with the official opening of McLaren Automotive's new Composites Technology Centre (MCTC). 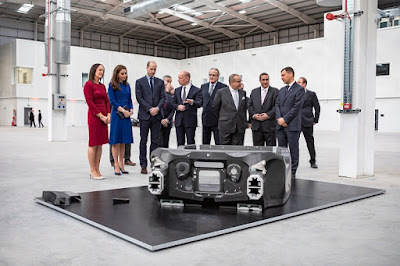 A £50m investment on the Advanced Manufacturing Park (AMP) in Rotherham has been officially opened by the Duke and Duchess of Cambridge and the Crown Prince of Bahrain, at an event attended by high-profile figures from across Sheffield City Region and the North. The SCR made a £12m investment into the project, while partners including the University of Sheffield, Sheffield City Council and Rotherham Council have worked closely with McLaren throughout the process. Dan Jarvis, mayor of the Barnsley, Doncaster, Rotherham and Sheffield Combined Authority (pictured, second right), said: "We know that our region is world-leading in advanced manufacturing and engineering. Investments from companies such as Siemens, Rolls Royce and Boeing are testament to our growing international reputation for excellence. "So it's great to see McLaren Automotive also opening here, demonstrating further confidence in our strong manufacturing heritage, confidence in our workforce’s ability to deliver, and confidence in the cutting-edge collaborations between university and business that enable us to lead the world. "McLaren will also be a key part of our "Global Innovation Corridor", creating a connected set of research and business interactions based on our advanced manufacturing and engineering strengths. The opportunities for our communities, for businesses, for researchers and for the workforce of the future are limitless. Today marks a hugely significant moment for South Yorkshire, the wider Northern Powerhouse, and indeed for the UK." Keith Ridgway, executive dean of the University of Sheffield Advanced Manufacturing Research Centre (AMRC), said: "It's great to see McLaren Automotive bringing the production of their supercar bodies to Britain; and even better that they chose to do it here in the Sheffield City Region. The AMRC's expertise in composites and lightweighting was a critical factor in this great British car maker’s decision to locate their own state-of-the-art factory here in Rotherham. "Our partnership with McLaren will help develop synergies between future powertrain development and the clever use of lighter materials to save weight and reduce the energy needed to power them. If the UK is to win the weight race, industry and government and universities must continue to work closely to ensure we make the most of what Composites UK estimate to be a £12 billion market by 2030. That's why we continue to invest significantly in our lightweighting capability." Cllr. 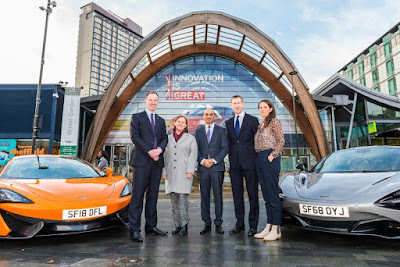 Chris Read, leader of Rotherham Council (pictured, far left), said: "This is further confirmation of the attractive location that Rotherham has become for investors, with McLaren joining a number of significant other inward investments over the last few years. The borough's Growth Board and Partnership – alongside our colleagues in Sheffield – are working to give businesses the confidence to invest in jobs, homes and developments and it has resulted in Rotherham becoming one of the fastest growing economies in the country. "More importantly, this investment should give confidence that the next generation of manufacturing can be secured in our part of the world. Today's Rotherham school pupils are going to grow up to build the next generation of supercars. By creating the right environment for these high skill, high investment businesses, we can ensure that Rotherham will again play an important role in the future of the national economy." The investment has also been welcomed by the Government. Minister for International Investment, Graham Stuart MP, said: "This is great news for jobs and growth in the UK. McLaren represent the best of British engineering and work closely with DIT and the GREAT Britain campaign to promote UK innovation to the world. "Today's opening of the £50m McLaren Composites Technology Centre, which will custom innovate and build the next generation of lightweight carbon fibre chassis and create over 200 new jobs, is another a vote of confidence in the UK as a world leading destination for global investment. "Famed for its traditional industries, the Sheffield region is once again attracting global investment. The city region's Advanced Manufacturing Innovation District is a great example of how international investment continues to create jobs and drive prosperity throughout the Northern Powerhouse."